After a great opening week in the NFL with some high scoring games we move on to the 2nd round of games with a little more insight into how teams are likely to perform this year, there certainly seem to be some teams moving rapidly forwards whilst others have not addressed areas of weakness over the summer & have regressed. One team that definitely look to be rapdily improving are the Detroit Lions - as they should be for a team that have had so many high draft picks after successive poor seasons including 2008 when they became the first team to lose all 16 games. The Lions beat the Buccaneers in week one & now take on the Kansas City Chiefs who got destroyed last week at home by, of all teams, the Buffalo Bills! The Chiefs looked short on ideas & were poor in their execution in against the Bills, picking up only 107 passing yards, Matt Cassel looked more like the 69.9 rated quarterback from 2009 than last year's 93.0 rated passer. The Chiefs went an impressive 10-6 last year but when relooking at their schedule it is easy to see why as they only beat one team (the notoriously slow starting Chargers in week 1) with a winning record. The Chiefs rely on Jamaal Charles running game being at a high kevel to set up Cassel to throw to Dwayne Bowe but if this 'Holy Trinity' don't click there is little to recommend on offense & their defense is average at best with a great cornerback in Brandon Flowers but a suspect defensive line. The Lions can take advantage of the D-Line with Matt Stafford high in confidence after throwing for 300+ yards last week, he'll look to hit the dependable Calvin Johnson & Nate Burleson often with accurate passes keeping the game moving. 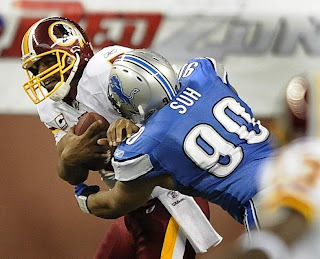 Star tackle Ndamukong Suh can pressure Cassel into making mistakes & their cornerbacks, including Chris Houston, will look to pick him off. Detroit should be bigger than -7.5 point favourites as they can run up a score on the poor Chiefs - back them at 10/11. Elsewhere our pre-season 25/1 tip for for the Super Bowl the Houston Texans travel to Miami to take on the Dolphins, there were conflicting fortunes in week one as the Texans destroyed the Colts minus Peyton Manning & the Dolphins scored 24 yet were still run over by the Patriots. Houston are an offensive powerhouse & can be expected to score points almost anywhere with a very good quarterback in Matt Schaub & an elite receiver in Andre Johnson, last year's lead rusher Arian Foster is likely to return & that makes them even more dangerous. The Dolphins gave up over 600 yards against the Patriots & although they had a good game offensively but it should be noted the Pats are changing up their defense this year & we're wholly unconvinced by Chad Henne at QB. Houston gave up countless yards through the air last year but their secondary has been improved whilst the Dolphins were an impressive defensive unit last year, it is tempting to select over 47.5 total points but only 4 Dolphins games went over that amount last year & that is enough to dissuade us. However we make the Texans bigger than 3 point favourites & they can be backed at 5/6 to cover the spread & continue their push for a divisional win. The headline game this week has to be the game in Foxborough with the New England Patriots hosting the San Diego Chargers, the teams are currently favourites & 4th favourites for the Super Bowl respectively. New England are general 7 point handicap favourites for this one & it's easy to see after posting 622 offensive yards last week but San Diego were the league leaders, statistically, in 2010 for both offensive yards gained & defensive yards given up so this should not be easy for the Patriots. Of course the Chargers special teams are another thing altogether, they were abysmal last year & on the very 1st play of this season they allowed a kickoff return for a touchdown & Bill Belichick will have instucted his team to take advantage of that. The points spread seems about right for this one but there is a decent price to be had about Deion Branch to score the 1st touchdown of the game at 16/1. Branch scored 5 touchdowns last year & was targeted regularly by Tom Brady last week getting 7 receptions for 93 yards & provides both a short & deep threat, he's as short as 9/1 with Paddy Power. Finally the Dallas Cowboys should be backed to take care of the San Francisco 49ers with the minimum of fuss. A lot of talk this week has been about the way in which the Cowboys threw away a 14 point lead against the Jets last week but it should be recognised how well they played in that game to get that lead against a team that have reached the conference championship for the last 2 years & San Francisco are nowhere near that quality. The 49ers won last week at home to Seattle but they certainly shouldn't get carried away with that result as the Seahawks are in for a season of struggle with Tavaris Jackson at quarterback, the 49ers own QB Alex Smith has yet to convince even after 6 seasons in the league & he'll have a hard game if Dallas's D-Line get the kind of pressure that they managed in the 1st half last week. Back Dallas to bounce back from their week one defeat at 4/6 without any handicap for what should be a very comfortable win.